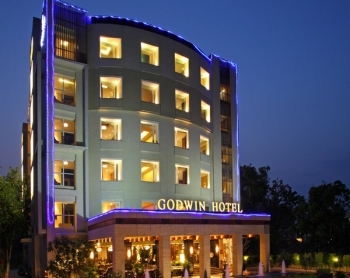 Godwin Hotel, Haridwar is one among the upcoming chain of luxury hotels in India. Hotel Godwin Haridwar is located on Rishikesh Road is a 4-star hotel that enjoys uncompromising location with all the tourist spots in close proximity. Hotel Godwin is where the age old Indian tradition of "Atithi Devo Bhava" meaning "Guest is God" is a way of life and where everyone is committed to taking guests to reverential heights. Hotel Godwin is located away from the hustle-bustle and crowd of both Rishikesh and Haridwar. Hotel Godwin is located at such a place that you can reach Har ki Paudi, Haridwar or Rishikesh by 5 minutes drive. Godwin is located at an equal distance between Haridwar and Rishikesh. A 5-star facility, Hotel Godwin has 120 rooms on offer spread across the categories of Executive, Premiere and Twin Queen Rooms and Presidential Suites. The air-conditioned rooms are equipped with cable and satellite television, intercom and direct dial telephones, data port, WiFi connectivity, refrigerator, kitchenette, fruit basket, and tea and coffee maker. The rooms also have sofa unit, study table, daily newspaper, electronic safe, fireplace, room heater and piped channel music. The bathrooms are equipped with bathtub, shower area, bathroom toiletries and a supply of hot and cold water. 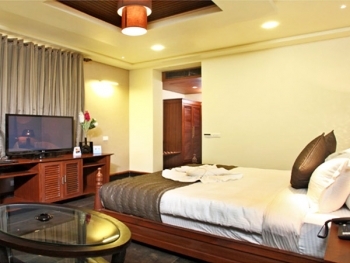 PREMIER Rooms: is luxuriously furnished to provide a handsome combination of technology and comfort to its guests. Round the clock client service and exquisite interiors together go into making these ultra modern ‘Executive Rooms’ most elegant and graceful hotel rooms. TWIN QUEEN Rooms: is artfully designed to provide deluxe comfort to our discerning guests. When putting up in a Twin Queen, the dwellers would experience a perfect blend of opulence and traditional beauty. HONEYMOON SUITE: For those who want to experience the quintessential regal lifestyle, Godwin offers ‘Honey Moon Luxury suits. Ideally, these are couple rooms and have been specially cut out for the artistic class of guests who do not settle down for anything less than perfect. PRESIDENTIAL SUITE: Enjoy the perfect luxury in well decor interior rooms and facilities like King Size bed or 2 Single bed with other luxurious facilities. Hotel Godwin operates 'Golden Mushroom', a multi-cuisine restaurant serving only vegetarian food. It also has 'Cafe Road', a 24 Hours Coffee Lounge and 'Jungle Bar' serving all liquor from Indian to imported highlighting the theme of jungle. Hotel also have special arrangements for Jain Food as well. Hotel Godwin Haridwar has a swimming pool, beach and pool beds, and lawns and gardens. It also has a business centre, conference hall, WiFi connectivity and health club and additionally provides doctor on call, baby sitting and handicap facility alongside airport and railway station transfers, laundry, guide and sightseeing services on a chargeable basis. Note*: Taxes as applicable would be charged extra. The Hotel reserves the right to change the tariff without prior notice. Check in time is after 1400 hours and check out by 1200 hours. Early Check in and late Check out is subject to availability.